MonJa, a San Francisco-based p2p investment analytics firm, recently partnered with NSR Invest to analyze the loan book of Lending Club in a new and unique way. 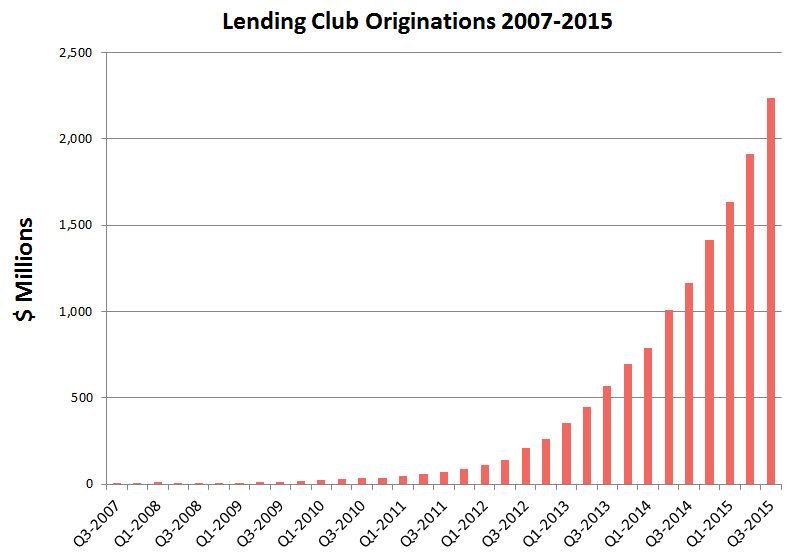 Lending Club returns have been measured countless times, in many ways. However, to our knowledge, no one has taken the important step of publishing a monthly vintage returns analysis, as we have below. In this short essay, we will explain how we measured the data, how to read the results, our conclusions from our analysis, and implications for peer-to-peer investors. Each vintage is represented in its own column, from left to right in chronological order. Each is a two-dimensional summary of the total return of that vintage and the volatility of cash flows associated with that vintage. The blue hash mark shows the total return of each vintage, which is a measure of interest earned net charge-offs, including reinvestment of principal, interest and prepayments through June, 2015. The black hash marks indicate the amount of cash flow volatility that an investor in each vintage experienced. The vertical line between the black hash marks is there to easily demonstrate the difference in volatility between the vintages. The first thing you might observe is that the black vertical lines are taller in the early vintages. This indicates that the volatility of cash flows has reduced over time. There are two apparent reasons for this. First, Lending Club’s credit analysis undoubtedly became more consistent as the company learned early lessons in underwriting. A real watershed moment occurred when Chaomei Chen took over as Chief Risk Officer at Lending Club in June 2011. We note that underwriting at LC continues to improve to this day. The greater the population in the dataset, the more predictable the distribution of data points. As you observe the vertical bars shrink in height for the later vintages in our volatility analysis, think first of loan volume, and then of underwriting consistency. 1. Improved underwriting. In other words, not just more consistent but better loan selection by Lending Club’s credit & risk team. 2. The addition of 60-month notes in May 2010, which generally have a higher rates of interest and attractive default characteristics. Note that the mix of 36 and 60 month notes has fluctuated quite a bit, as noted in this 2012 article from Lend Academy. 3. Attractive economic environment. While no doubt it has been a long, slow climb out of the Global Financial Crisis, the time period spanning 2009 through today has seen an increase in gainfully employed Americans, which bodes well for p2p returns. We repeated the process (net cash flow reinvested) for every month following, through May 2015. The resulting vintage return is summarized in the chart. If returns are this good, why use NSR Invest? Portfolio protection. Past performance does not guarantee future returns. This oft-repeated admonition to investors is not just legal CYA. 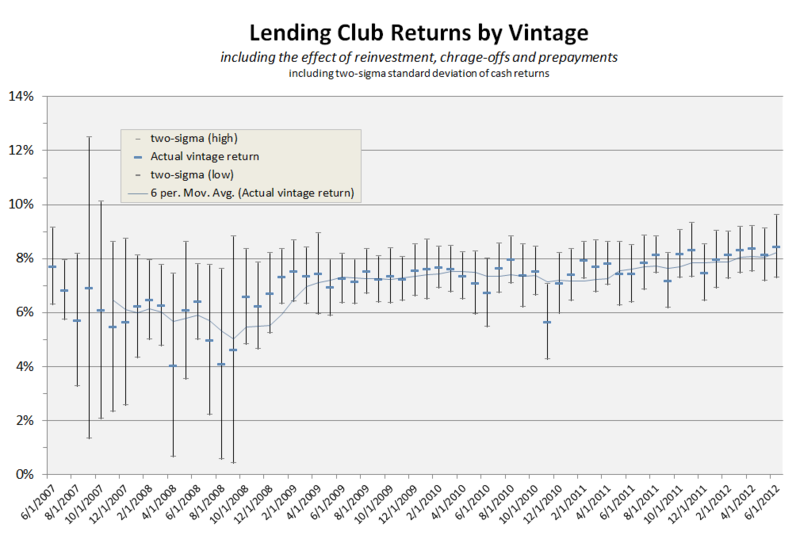 The fact is, Lending Club portfolios haven’t been tested in a recessionary environment at large volume. We believe our loan selection algorithms, which select anywhere from the top 50% to the top 5% of any single loan grade, may increase net returns during good times and protect portfolios during times of economic duress. Customized risk-return profiles. If you plan to do anything other than simply index Lending Club originations, you are undertaking risk by investing in a subset of originations. And with nearly 13,000 loans originated in the fractional pool last month, you would need to invest more than $300,000 per month to truly index the platform. Therefore, if you are managing your own account, you must customize your portfolio. Which loans should you select, according to your risk appetite? This is where NSR Invest shines. Managing multiple accounts. Financial advisors: your clients are yield-starved, and p2p lending offers a promising solution. NSR Invest’s unique platform allows financial advisors to manage hundreds o/f Lending Club accounts from a central console. NSR also integrates with portfolio management systems like Orion Advisor, and data aggregation tools like By All Accounts, so p2p portfolios can be reported alongside traditional stocks, bonds, and cash. The most basic and fundamental question we are asked is this: why is p2p any different than regular borrowing and investing? The answer is this: it simply works better. Borrowers are able to borrow, on average, at a materially lower cost with much less pain in a more convenient way — online. Intermediaries like Lending Club and NSR Invest operate in an extremely efficient manner, far more efficiently than old-school institutions like brick-and-mortar banks and monolithic wirehouses. And investors gain the benefit of this efficiency. Who gains the most, borrower or investor? As both a former borrower and current investor, I can say with high confidence that the experience is superb on both sides of the equation. Like I said: it just works better. We’d love to hear your feedback. Is this analysis helpful to you? Did we help you understand p2p lending more deeply? What other questions do you have? What analyses would you like to see us perform next? For this analysis, and generally in the p2p industry, we speak of “vintages” as the cohort of loans originated in any given month. P2P loans are viewed as long-only investments; that is, an investor cannot short-sell them in an organized marketplace like a stock market, and there is no public pricing associated with the securities. As such, it is impossible to measure the volatility of the loans in terms of public-market pricing, the way that most publicly traded instruments are measured. One can only measure the volatility of cash flows; the fluctuations in the interest received, net of charge-offs. The hashmark is placed at 2x the standard deviation of the change in “price” of the cohort, as dictated by the change in value of the cohort, or cumulative net interest gained (or lost). This assumes that the only pricing mechanic in the security is the value of the net cash returns. This is known as a two-sigma variance. We express this as “the range of returns that could have been expected by a hypothetical investor, with 95% confidence, at the time of investment.” Keep in mind that this is a backward-looking analysis; we can assure you that the early investors in Lending Club loans were investing by faith, not by the quantitative data we have today. Hats off to them! Cohorts originated after June 2012 are not fully matured and therefore would skew to an artificially higher return because all charge-offs in the cohorts haven’t been realized yet.